Rula Yearsley Gowers passed away peacefully on February 8, 2019 at the age of 100. Born in Malad, Idaho on March 23, 1918 to Nathan Melvin Yearsley and Josephine Jones Yearsley, Rula attended grade school in St. John, Idaho and High School in Malad. After graduation she continued her education at the Collegiate Beauty School in Logan, Utah. In Logan she met Don Gowers who was attending Utah State Agricultural College. Rula and Don were married November 29, 1943 in the Logan LDS Temple. Their first child, Marion, was born while Don served in World War II. When her husband returned, Rula and Don moved to his hometown of Nephi, Utah. There two more children joined their family, Clyde and Deltha. While her children were young Rula used her beauty school skills to keep their hair curled and cut. She later worked part time at Christensen’s/Brinkerhoff’s Department store. When the store closed its business in Nephi, she had more time to sew, can fruit and to grow beautiful flowers. Rula loved music, having learned to play the piano and sing while she was young. 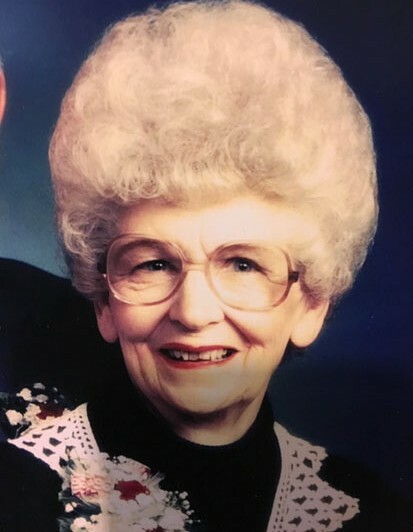 She used her musical talents in her callings as Junior Sunday School / Primary chorister and/or pianist for the Church of Jesus Christ of Latter-day Saints in her ward for many years. She also served as a Relief Society Chorister, Nephi Stake Music Chairman and as a Church-service Missionary in the Welfare Services Department. Additionally, she sang a strong alto in the ward and stake choirs most of her life. Rula is survived by her children Marion Watko of Nephi, Clyde (Bonnie) Gowers of South Weber, Deltha (Todd) Nelson of Phoenix, one brother Evan Joyce Yearsley of Orem, 13 grandchildren, 27 great grandchildren and 1 great great grandchild. She was preceded in death by her husband Don Gowers, her parents, 6 sisters and 1 brother. Funeral services will be held on Monday, February 18, 2019 at 11:30 am with a viewing beginning at 10:00 am at the Nephi North Stake Center, 1125 North 400 East, Nephi. Burial at Vine Bluff Cemetery, Nephi, Utah.